Scarborough, Maine – Hannaford Supermarkets today announced more than $400,000 in donations to strengthen the connection between local food producers and organizations that serve people at risk of going hungry. Maine organizations will receive $140,000 of the total. The grants will provide farmers with refrigerated transport for donated crops; fund pilot programs to bring local produce to low-income children and senior citizens; help people who are struggling financially to grow food and become farmers; assist food banks in the acquisition of products that are grown nearby; and support numerous initiatives focused on producing nutritious, local food for low-income individuals. Earlier this year, Hannaford encouraged customers to purchase healthy food – items that received at least one star through the Guiding Stars nutrition navigation program. For every item purchased, Hannaford promised to make a financial donation toward hunger relief. The initiative triggered $407,000 in donations by Hannaford across its five-state market area. Hannaford announced those donations this week at a farm in rural Hollis, N.H. and a community garden at Kennedy Park, a low-income housing community in downtown Portland, Maine. Today’s announcement took place in the East Bayside neighborhood of Portland at the Boyd Street Urban Farm, which is managed by Cultivating Community. The farm encompasses community-garden plots and teaching-gardens, where participants in Cultivating Community’s Youth Growers program grow food that they personally deliver to elders and others experiencing food insecurity. 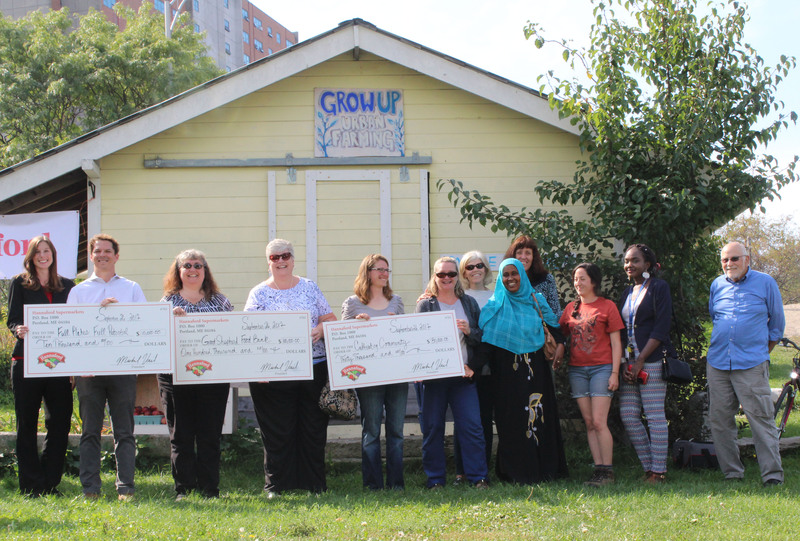 Cultivating Community plans to use its $30,000 donation to further expand access to healthy food, to land for growing food, to leadership opportunities, and to opportunities to build community for people of all ages who are socially and economically disadvantaged. This week’s Hannaford Helps donation builds on existing initiatives to fight hunger across the Northeast. Last year, Hannaford donated 23 million pounds of meat, seafood, produce and packaged food to local pantries and food banks. The company also supported nutrition education programs for low-income individuals, helped establish in-school food pantries and generated $1.3 million in donations through our fall Hannaford Helps Fight Hunger campaign. Hannaford Supermarkets, based in Scarborough, Maine, operates 181 stores in the Northeast. Stores are located in Maine, New York, Massachusetts, New Hampshire, and Vermont. Hannaford employs more than 26,000 associates. Additional information can be found at www.hannaford.com.